We were looking for an article about the Sacramento protest, where more than 25 dedicated advocates from around the West endured 104 degrees in front of the Federal Courthouse to stand up against roundups. Sadly only a fluff piece was published that belittled public outrage over cruel roundups. BLM California’s Amy Dumas is quoted as saying “most people who protest roundups don’t understand them”. ” . . . Until last fall, all of the horses were living in the wild, according to Amy Dumas, manager of the wild horse program for BLM in California. She said they had been gathered in a round-up, a BLM tactic used to maintain the growing population of wild horses. She likened the process to a helicopter acting as a sheepdog and herding horses into pens. Roundups are controversial – on Tuesday, about 15 people from throughout California and Nevada protested BLM’s roundup program outside of Sacramento’s federal courthouse. 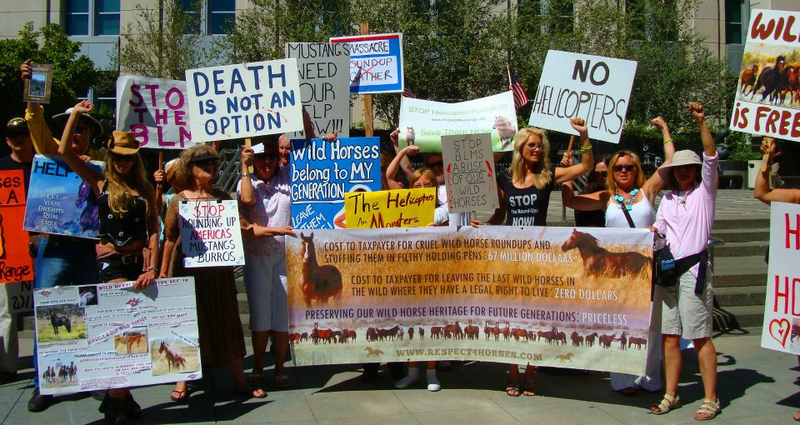 The protestors said horses are a national symbol of freedom that deserve to stay in the wild and roundups are abusive. Dumas said most people who protest roundups don’t understand them. Beverly Moss, who attended Saturday’s event with family members, agreed and said she has watched a BLM roundup. Please comment at the link and share this so others will have a chance to comment on BLM spin.